How to watch Vikings: Season 5: Vol. 2 (2017) on Netflix Austria! Sorry, Vikings: Season 5: Vol. 2 is not available on Austrian Netflix, but you can unlock it right now in Austria and start watching! With a few simple steps you can change your Netflix region to a country like Spain and start watching Spanish Netflix, which includes Vikings: Season 5: Vol. 2. 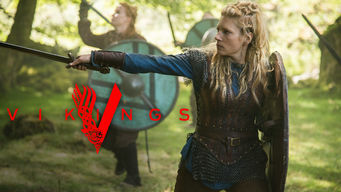 We'll keep checking Netflix Austria for Vikings: Season 5: Vol. 2, and this page will be updated with any changes. Vikings: Season 5: Vol. 2 is not available in Austria BUT it can be unlocked and viewed! Season 1 of Vikings has 9 episodes. Because different Netflix countries have different availability for episodes, you'll need to check the episode listing below to see which are available in Austria. Ragnar Lothbrok is determined to sail west to discover new lands and riches despite an intimidating warning from Earl Haraldson. While Ragnar and his crew prepare for their first journey to the West, the furious Earl Haraldson vows to obtain revenge for their rebelliousness. After the Vikings successfully complete their first raid on England, Ragnar chooses an unusual reward and Haraldson schemes to gain the upper hand. Accompanied by Lagertha, Ragnar plunders the English town of Hexam, and upon the warriors' return, must face Haraldson’s wrath over a desperate deed. Haraldson's paranoia leads him to attack Ragnar, and after a narrow escape, Ragnar must chose between a life in exile and a battle to the death. Although he is still weak, Ragnar cannot ignore the torture of his brother and so challenges Haraldson to a single combat duel to the death. Ragnar and his men do battle with the army of the Saxon king, Aelle, and treachery on both sides threatens to undermine attempts to broker a peace. During a traditional pilgrimage to thank the gods, Ragnar, Lagertha and Athelstan all grapple with their loyalties to themselves and one another. While Ragnar goes on a diplomatic mission for the king, Rollo switches alliances, and Lagertha combats a deadly epidemic sweeping through the village. Season 2 of Vikings has 10 episodes. Because different Netflix countries have different availability for episodes, you'll need to check the episode listing below to see which are available in Austria. The war between Ragnar and King Horik’s forces against Jarl Borg pits brother against brother. Princess Aslaug comes to Kattegat, bringing a surprise. An unlikely alliance forms around a common goal -- a raid on England. A storm takes Ragnar and his fleet off course, where they face a dangerous foe. King Ecbert faces an entirely new kind of foe. Ragnar races to dominate in the West, but Jarl Borg has his own plans for the future of Kattegat. 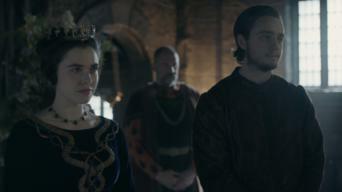 The meeting of Ragnar and Ecbert may pave the way for future compromise. Jarl Borg rules Kattegat with an iron fist, so Rollo must step up and lead. With Lagertha's reinforcements, Ragnar strikes to reclaim Kattegat from Jarl Borg. In Wessex, Athelstan wrestles with his former Christian beliefs. Horik returns to Kattegat with a proposition for Ragnar, Lagertha's homecoming leaves her wanting and Athelstan becomes King Ecbert's confidant. Ragnar and King Horik clash over how to dispense justice to Jarl Borg. In Wessex, King Aelle arrives, and Ecbert has an eye on a new alliance. Princess Aslaug’s prophecy comes true as she readies for another birth. Ragnar and Horik have different purposes in mind as they set sail for Wessex. As Ragnar’s Viking warriors march toward King Ecbert’s villa, they are met by a surprisingly vicious welcome party. A bloody battle brings new terms. As Ragnar and King Horik return to Kattegat, their final showdown is at hand. The time has come for Ragnar to place his trust in new alliances. Season 3 of Vikings has 10 episodes. Because different Netflix countries have different availability for episodes, you'll need to check the episode listing below to see which are available in Austria. Ragnar and Lagertha's fleets sail with a group intending to colonize Wessex. King Ecbert offers a deal. Ragnar forms a surprising alliance. Lagertha and Athelstan help establish the Viking settlement in Wessex. A mysterious wanderer arrives in Kattegat, realizing forewarned dreams. King Ecbert visits the developing Viking settlement. The Wessex-Viking forces charge into battle with Mercia. Siggy sees past Harbard's charms. The Wessex-Viking forces return victorious, but Floki is angry over the alliance with Ecbert. Princess Kwenthrith makes calculated political moves. The fleet returns home, where tragedy awaits. 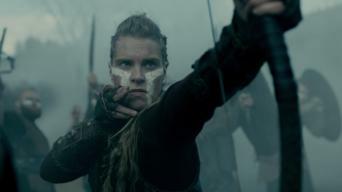 Lagertha urges Ragnar to travel to Hederby and reclaim her title. The Seer foretells intrigue for Rollo. As preparations for the Paris raid accelerate, Rollo ponders his destiny. 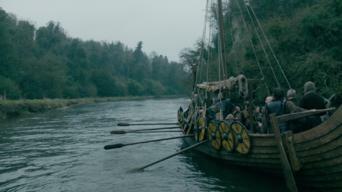 Kalf arrives in Kattegat. Porunn and Judith both give birth. The arrival of the Viking fleet in Paris sparks a panic, but Count Odo is confident that the city is prepared for the attack. Under Count Odo's direction, Paris goes into a lockdown, but the Vikings are determined to break through the city gates. The Vikings stage an all-out assault on Paris, forcing a desperate Emperor Charles to make a hard decision. Judith faces a tough choice of her own. Rollo's destiny is recognized and Bjorn steps up as a leader. With one last chance to take Paris, Ragnar and his Vikings troops take a daring chance. Season 4 of Vikings has 20 episodes. Because different Netflix countries have different availability for episodes, you'll need to check the episode listing below to see which are available in Austria. Ragnar suffers a disquieting dream, Aslaug seeks answers about the future, Rollo takes a big step, and Floki clashes with Bjorn. Bjorn sets out on a quest of survival, Ubbe exhibits his toughness during a hunt, Floki's circumstances worsen, and Rollo tries to blend in. Ragnar and Ecbert share a vision, Rollo's bride refuses to be won over, and Bjorn meets a ferocious adversary in the wildnerness. As the yule log burns in the great hall, Ragnar bonds with Yidu over a shared fate. Meanwhile, Bjorn fights for his life and his love. Ragnar and Yidu continue to confide in each other, an unexpected visitor arrives in Kattegat, and a joyous occasion takes a sudden turn. Ragnar, Lagertha and Harald set sail against Paris but get blown off course. Meanwhile, Ecbert sends Aethelwulf and Alfred on a holy quest. Ragnar announces a double-edged attack on Rollo. Meanwhile, Harbard and Aslaug share an intimate moment, and Floki has a disturbing vision. Ragnar's abilities are called into question, Gisla reveals important news, Yidu makes a fateful decision, and Rollo's victory is rewarded. Harald and Halfdan leave a trail of destruction, Lagertha suffers a personal setback, Alfred is honored in Rome, and Erlendur makes a demand. 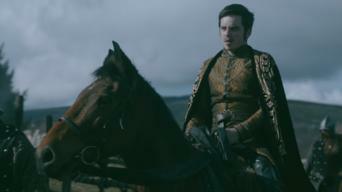 As Charles makes a fateful decision, a bitter battle between Rollo and Ragnar may change the very course of history. 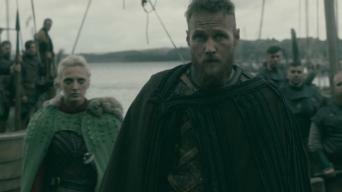 Ragnar returns to Kattegat and asks his sons to sail with him to England. A family feast ends in anger. Ivar is outwitted by a slave girl. As Bjorn prepares to sail to the Mediterranean, Ragnar faces new challenges to man his own ships. Aslaug has a terrifying vision. Bjorn must make a bargain with an old foe to realize his dream. Meanwhile, Ragnar makes new plans when his army is drastically reduced. After a Viking funeral, Lagertha finally achieves her goal. 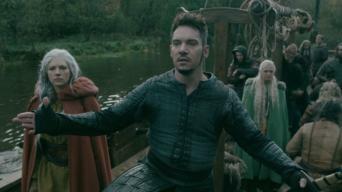 Ragnar is captured but negotiates terms with King Ecbert after meeting a new relative. Ivar is sent home while Ragnar awaits his fate. A disguised cleric offers comfort. Ivar's return heightens Lagertha and Astrid's fear of the future. While Ivar extends a challenge to Lagertha, Ecbert and Aethelwulf disagree on the threat Ivar poses. Bjorn and his men pillage a Muslim city. Bjorn returns to Kattegat and joins his brothers' plan to raise an army to avenge Ragnar, but he warns Ivar not to move against Lagertha. Warriors from many nations join the great army. Ubbe and Margrethe's wedding night ends with an alliance. King Aelle prepares for a brutal battle. King Ecbert and Prince Aethelwulf prepare for the advancing Viking army at the same time Lagertha leads a fierce battle against invaders in Kattegat. Ecbert greets the Viking army after initiating his own plan for revenge. A victory celebration is more bitter than sweet for the sons of Ragnar. Season 5 of Vikings has 10 episodes. Because different Netflix countries have different availability for episodes, you'll need to check the episode listing below to see which are available in Austria. Ivar attempts to win over Ubbe and Hvitserk with a bold strategy for the Great Army. A devout power rises among the Saxons. Floki charts a new course. King Harald's return to Kattegat doesn't sit well with Lagertha. Alliances form to challenge the Northmen's hold on York. Floki hits rough waters. Bishop Heahmund and Aethelwulf put their battle plan in motion, a move that divides the sons of Ragnar. Harald introduces Astrid to his people. Lagertha makes an offer to Ubbe, while Astrid considers one from Harald. Heahmund devises a new plan of attack, and Bjorn expands his horizons. As he plots his next moves, Ivar takes a keen interest in Heahmund. Floki comes back to Kattegat. Bjorn discovers not all is as it seems in Africa. With Heahmund in tow, Ivar approaches Harald with a proposition. Lagertha's hold on her people falters, and one ally pays a high price for loyalty. Bjorn makes changes upon his return to Kattegat, where Lagertha gears up for war. Astrid reveals big news, and suspicion tinges Floki's flock. It's brother versus brother in the fight for Kattegat, as old scores are settled, and traps laid. Floki and Alfred both envision brave new worlds. In the battle's aftermath, new relationships are forged, and fealties sworn. Elsewhere, Floki faces familiar troubles, and Alfred's life changes. Blood spills and bonds break in the war for Kattegat, with Lagertha, Harald and Ubbe facing off against loved ones on the field of battle. Season 6 of Vikings has 10 episodes. Because different Netflix countries have different availability for episodes, you'll need to check the episode listing below to see which are available in Austria. After the fierce battle for Kattegat, Ivar remains fixated on revenge, while Bjorn receives unwelcome news and Lagertha weighs her dwindling options. 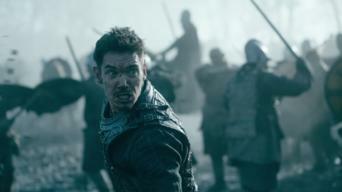 Intrigue both political and romantic ignites over Heahmund's connection to Lagertha, Ivar's new consort and Alfred's treatment of his potential queen. Ramifications from Heahmund's decisive action against Lord Cuthred reverberate. In Kattegat, Ivar's delusions of grandeur take an ominous turn. 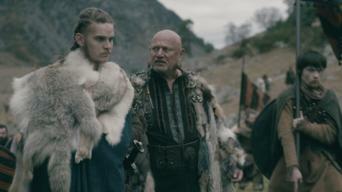 Suspicion surrounds Ivar's dramatic sacrifice. Conspiracies arise against Alfred as Harald's forces close in. Tragedy leads Floki to an epiphany. With the Vikings at his back, Alfred prepares to fight for Wessex, while a disturbing vision convinces Heahmund to forsake his desires. In the aftermath of battle, the sons of Ragnar fulfill one of his greatest dreams. Meanwhile, Bjorn meets his match and Hvitserk discovers a new path. As a new threat approaches Wessex, Bjorn plots with Harald, Ivar makes Hvitserk an offer he can't refuse and Floki's faith suffers a shocking blow. Ivar grows ever more merciless, Ubbe undertakes a bold plan before battle, Judith makes a startling discovery, and Hvitserk endeavors to sway an ally. Ragnar's sons move toward their fates as Ivar faces questions over Baldur, Ubbe fights to the death, Floki finds the unthinkable, and Bjorn heads home. Bloodshed, betrayal and seemingly impossible odds define the latest showdown for Kattegat when Bjorn leads the charge to seize the crown from Ivar.